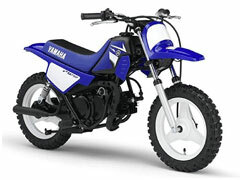 Release of the 2008 kids "Play Bike" model PW50 with new image defined by two-tone color schemePW80 also to be released with new coloring - News Releases | Yamaha Motor Co., Ltd.
On June 30, 2007, Yamaha Motor Co., Ltd. (YMC) releases on the Japanese market the 2008 model of its children's play bike "PW50" that mounts an air-cooled 2-stroke single-cylinder engine with automatic transmission and now boasts the same coloring and graphics as the 4-stroke YZ series models. It also features a new two-tone color scheme for the fuel tank and seat. On September 10, 2007, YMC also releases the "PW80" featuring the same graphics as the 2008 YZ series. The "PW50" is designed as an entry-level model for children ages 3~6 or so (weight under 25 kg) and offers features including (1) an automatic transmission for easy operation, (2) a lightweight body that is easy to manipulate, (3) shaft drive that requires little or no maintenance and (4) the same type of right-left hand brakes as a bicycle. The "PW80" is designed for children ages 7~10 or so (weight under 40 kg) and offers features including (1) an automatic clutch and 3-speed transmission that lets children enjoy gear changing without the need for clutch operation, (2) spoke wheels front and rear, (3) Monocross suspension and (4) a front fork with aluminum outer tubes. 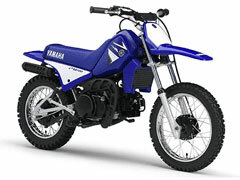 In North America, these models are popular as Christmas presents for children, especially in families where the parents have YZ models and enjoy off-road riding as a family.